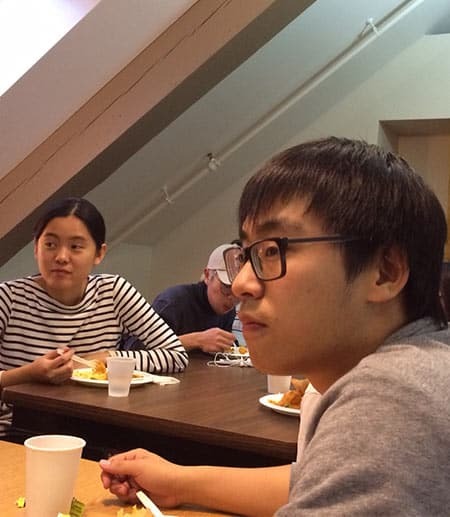 Asian American Studies Program students and staff gathered Nov. 9 in Rockefeller Hall for a catered Indian lunch and a talk on the U.S. election results with program director Derek Chang, associate professor of history. Chang put the election results into a context based on his research into the years during and after Reconstruction. “After Emancipation was a moment of great hope and opportunity in America,” he said. “But during Reconstruction African-Americans also expressed fears that slavery would come back, and in fact we did get a system that looks a lot like slavery: sharecropping and Jim Crow. Commenting on the surprise they felt about the election results, several students reflected on the problem of existing in an “echo chamber” of social media, where they hear only from people who think like they do. One student from Hong Kong said that if he had been white working class, he might have voted for Trump. He could understand their feeling that they had no future and that the system was unfair, he said. Policies since the 1960s have seemed to set up this us-them dichotomy that Obama and Clinton in certain ways embodied, Chang said. People who were already struggling felt that they were having more things taken away from them by elites and immigrants. “Affirmative action is an example of something that these voters saw as benefitting someone else by taking opportunity away from them,” he said. The Nov. 9 talk was the final session of the Asian American Studies Program’s Wednesday Lunch Series, which presents faculty, staff and visiting speakers speaking on Asian-Pacific Island research or diversity issues. The series will resume again in the spring semester.